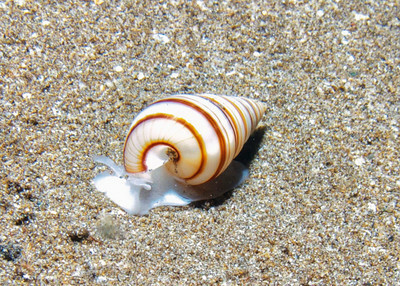 They make beautiful shells for themselves (and for hermit crabs and octopi after they're done with them). 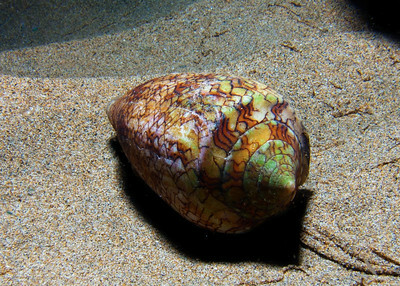 A very large Triton's trumpet (Charonia tritonis). 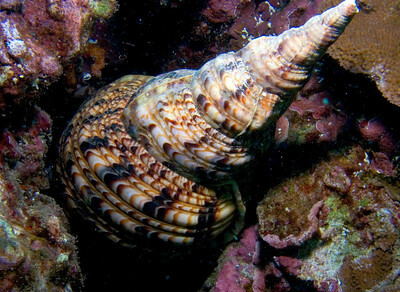 This massive gastropod is the largest species found in Hawaii. 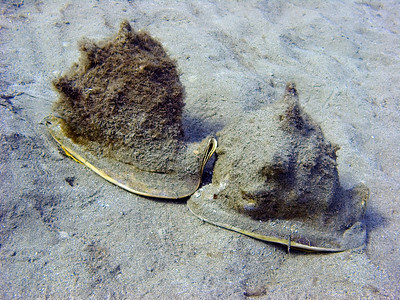 Two Horned Helmets (Cassis cornuta) I believe engaged in mating behavior. 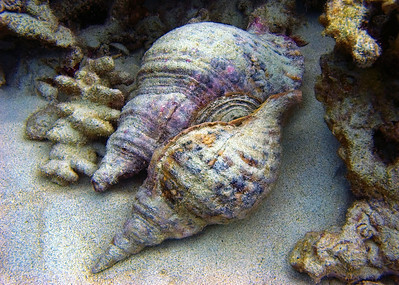 These large, heavy-shelled animals are also known as Helmet conchs, although technically Cassidae are not true conchs. 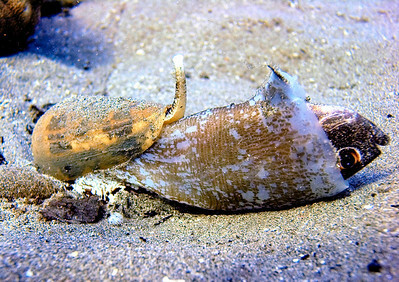 Mating Triton's trumpets (Charonia tritonis)--almost making a valentines heart. 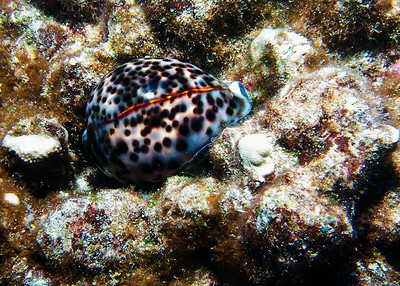 One of my personal favorite shots. 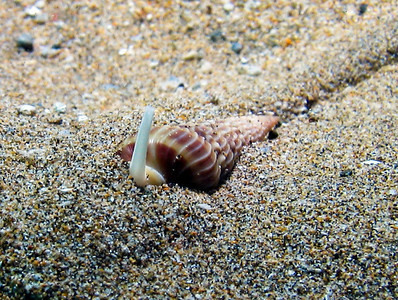 A Striated cone (Conus striatus), having a meal. 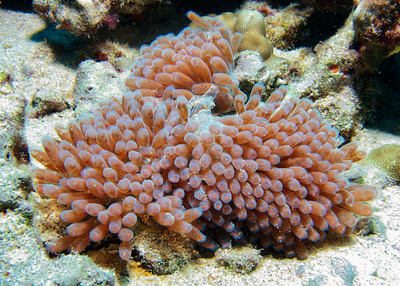 I was fortunate enough to be present for the initial hunt and full process of feeding. 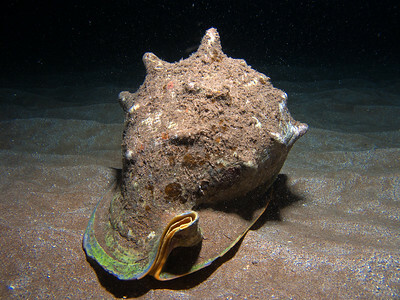 Took this just for fun--one of the largest tritons trumpets (Charonia tritonis)I've ever come across (the widest part of the opening shown here is about 6") with just beautiful markings on the innner shell. 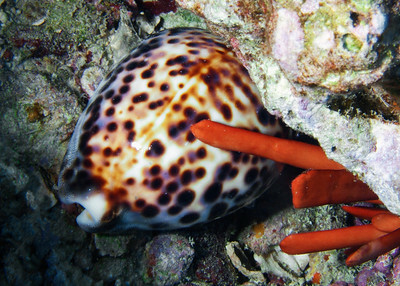 A big, beautiful tiger cowry (Cypraea tigris)with mantle fully extended around it's shell. 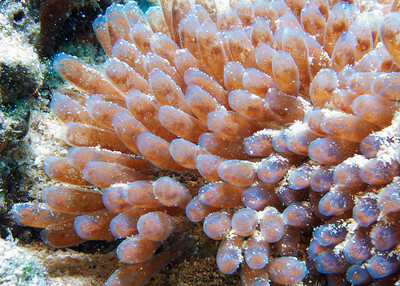 Now you know how they stay so shiny! 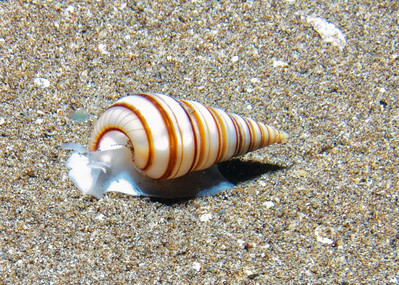 This is a Ringed pyramid shell (Pyramidella dolabrata), and one of the prettiest gastropods I've seen--look at those spirals! 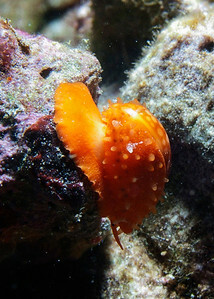 A Reticulated cowry (Mauritia maculifera) adhering to the roof of a cavern at Makena Landing, Maui. 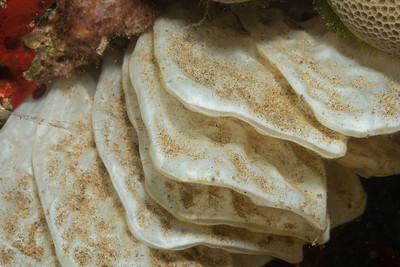 You can see the greyish papilate mantle extending around the lower edges of the shell. 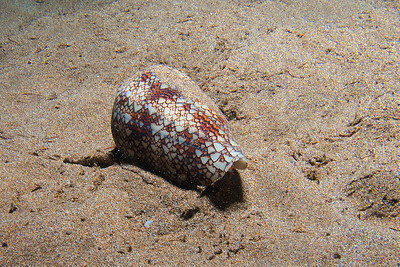 This is one of the single largest specimens of Conus textile I've ever seen. 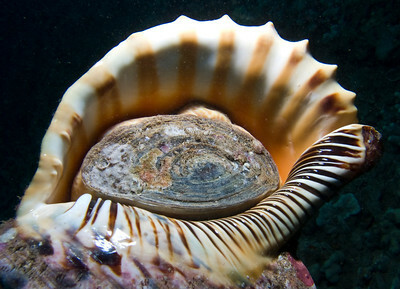 A lovely shell--but Textile cones should never be touched. 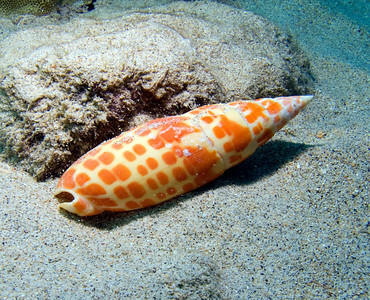 Like many cones, C. textile has the ability to sting with a venomous dart, and in the case of this animal that venom is potent enough to be a danger to humans. 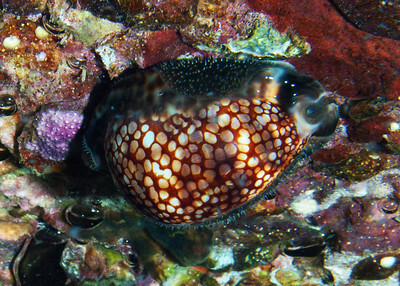 Gaskoin's cowry (Cribrarula gaskoini)...you can see the papillate mantle of the animal extending around the shell, as in most cowries. 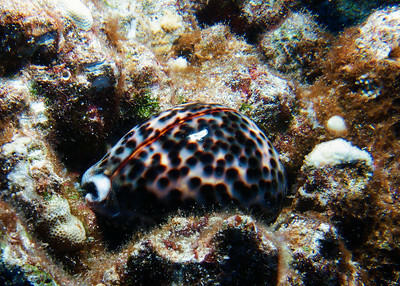 The finely polished shell of a Tiger cowry (Cypraea tigris)--the animal itself has withdrawn into its shell for the day. 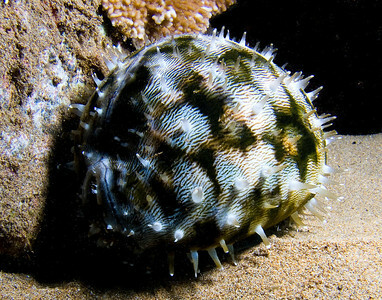 C. tigris grows much larger in Hawaiian waters than anywhere else in the world. 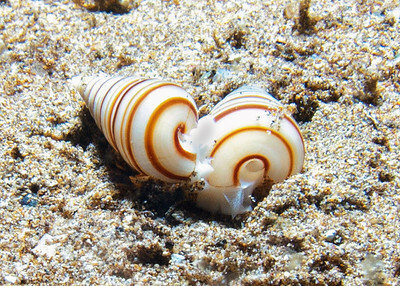 A pair of Ringed pyramid shells (Pyramidella dolabrata), perhaps preparing to mate?